But, if I'm not nothing, if I won't be nothing, why these dreams of glory since I can think? The Circle of Friends of Marie Bashkirtseff has been created in 1987. Their main objective is the integral publication of the Diary of Marie Bashkirtseff. To constitute a library that gathers all publications concerning to Marie. To gather all documents concerning to Marie and to look after the conservation of their material souvenirs. To maintain relations between admirers of Marie Bashkirtseff. 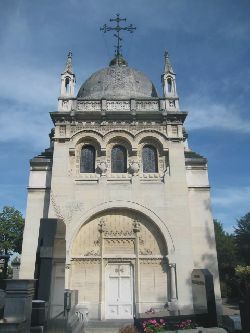 To look after the maintenance of the Mausoleum of Marie Bashkirtseff in the cemetery of Passy (photo) and the conservation of the souvenirs that it contains. du Cercle des amis de Marie Bashkirtseff (look, in french). Volumes published by the Circle (all in French), transcript by Ginette Apostolescu. Around 300 pages each, with index of cited names. Tome I: From january 11, 1873 to august 10, 1873. Preface of Pierre-Jean Rémy, of the French Academy.